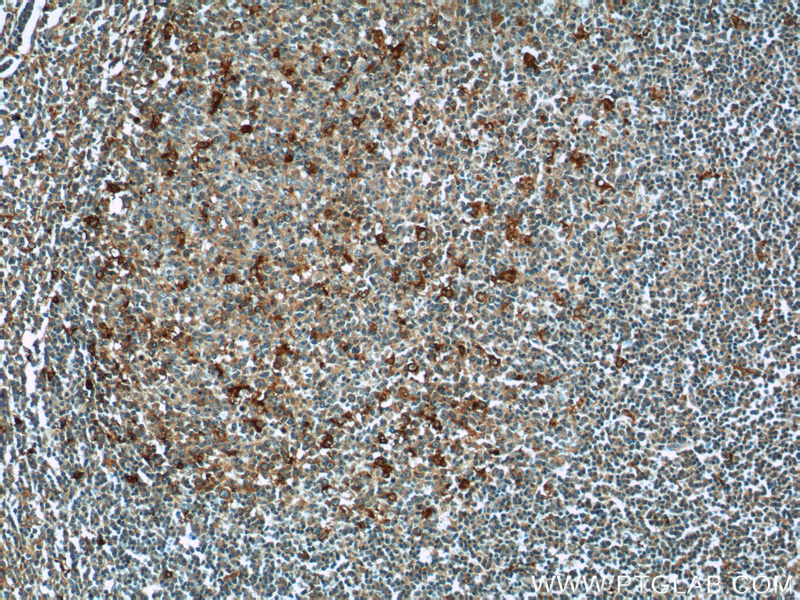 IP Result of anti-CEP63 (IP:16268-1-AP, 3ug; Detection:16268-1-AP 1:500) with HEK-293 cells lysate 1700ug. 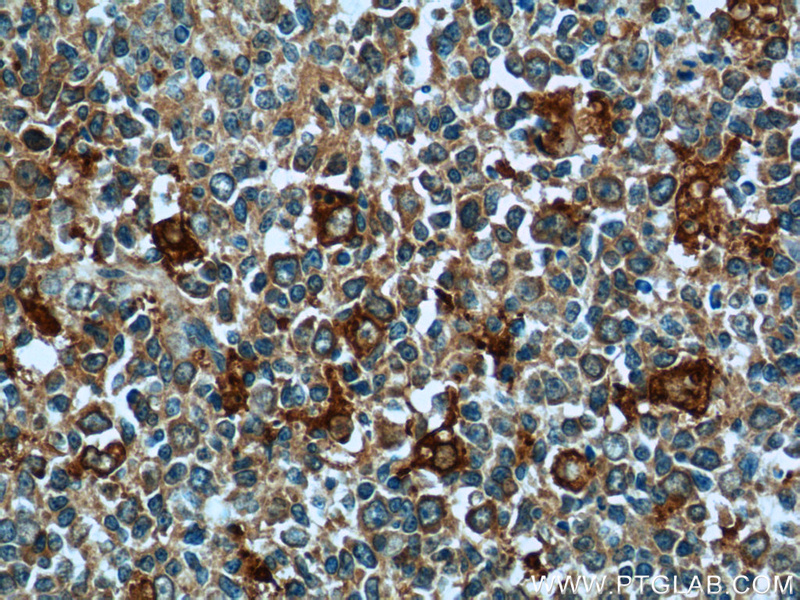 CEP63 is a 63 kDa centrosomal protein. It is required for normal spindle assembly. It maintains centrosome numbers through centrosomal recruitment of CEP152. CEP63 recruits CDK1 to centrosomes. It plays a role in DNA damage response. 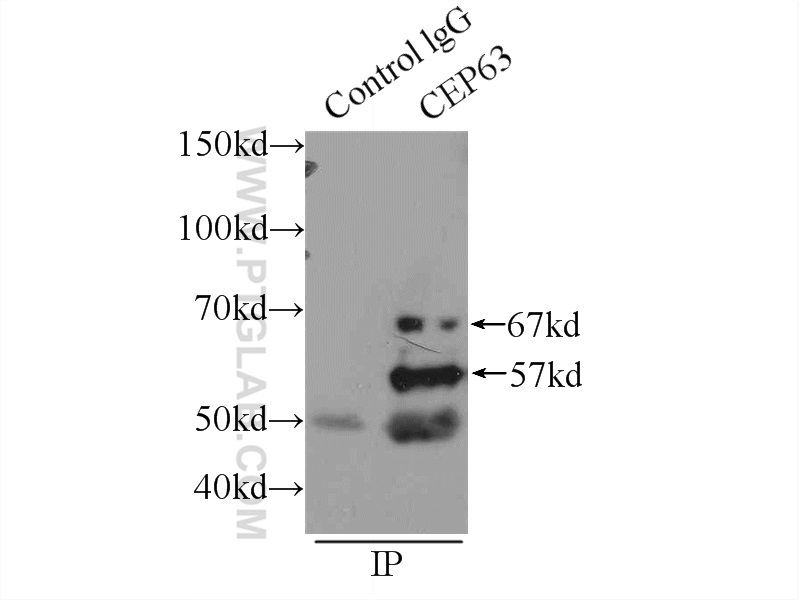 This antibody can recognize all the four isoforms of CEP63 (56 kDa, 58 kDa, 63 kDa and 81 kDa). 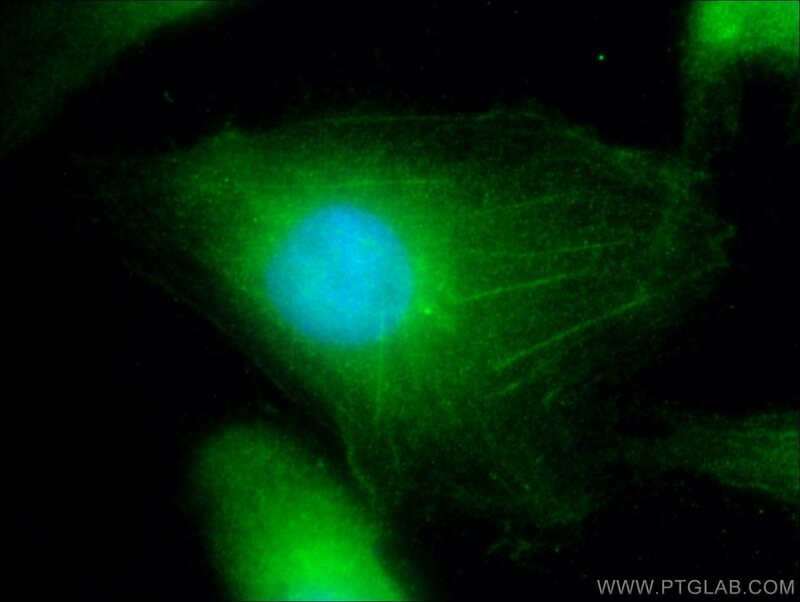 Cep63 and cep152 cooperate to ensure centriole duplication. A dual role for UVRAG in maintaining chromosomal stability independent of autophagy. Truncating mutation in the autophagy gene UVRAG confers oncogenic properties and chemosensitivity in colorectal cancers. Autophagy controls centrosome number by degrading Cep63. 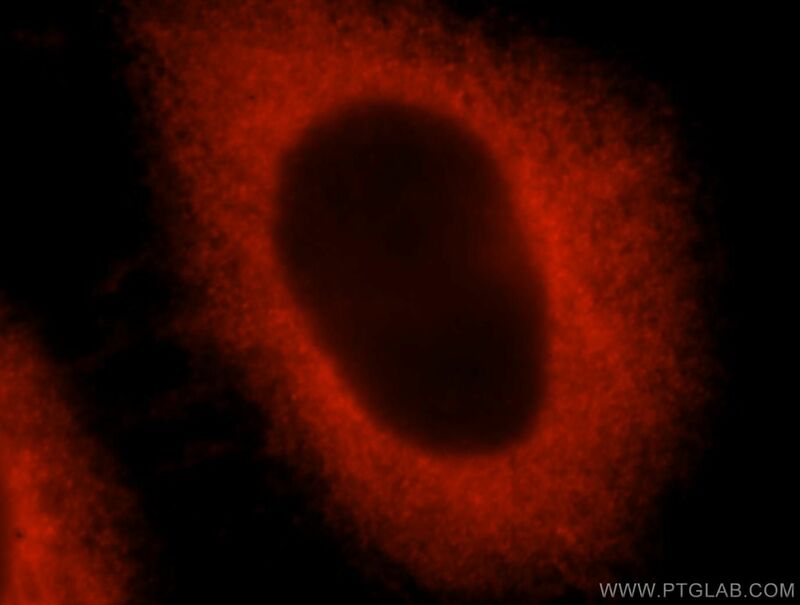 Immunofluorescent analysis of HepG2 cells, using CEP63 antibody 16268-1-AP at 1:50 dilution and Rhodamine-labeled goat anti-rabbit IgG (red). 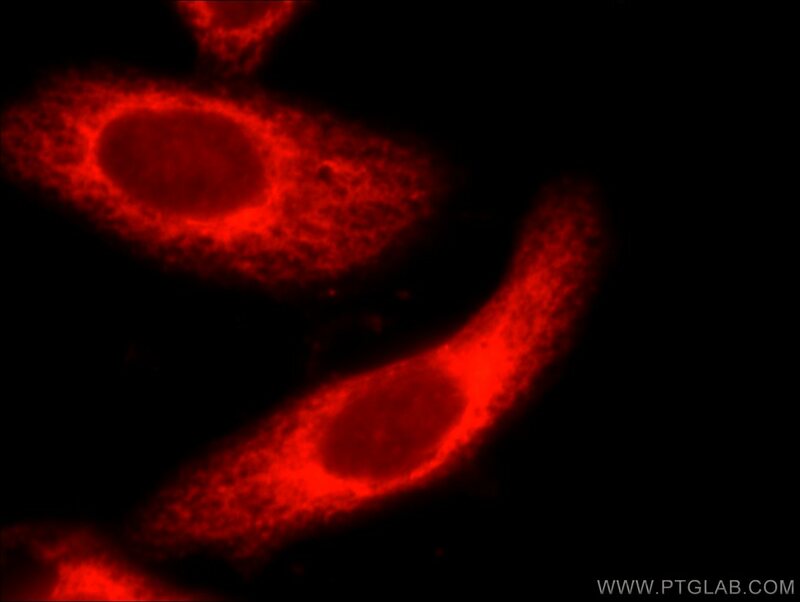 Immunofluorescent analysis of MCF-7 cells, using CEP63 antibody 16268-1-AP at 1:25 dilution and Rhodamine-labeled goat anti-rabbit IgG (red).